350 ton travel lift is a particular heavy duty gantry crane. 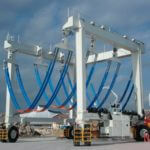 With large loading capacity, it can lift and transport large boat smoothly and stably. 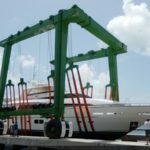 As a dedicated hoisting machinery, 350 ton boat lift is used to up and down water work of the boat and level transportation, main used to ports. Crane traveling mechanism adopts compact U shape structure. 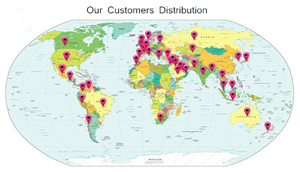 The wheel can achieve 360 degree turn and run diagonally. Complete machine is controlled by hydraulic and electric equipment. 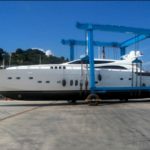 Our company, a well-known travel lift manufacturer in China, provides reliable marine boat hoist cranes for sale. The crane has stable performance, simple structure, high safety, long service term. 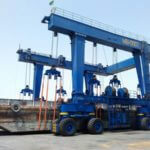 Do u need mobile boat hoist crane? Just send inquiry to sales@marinetravellifts.com . Why choose 350 ton travel lift? 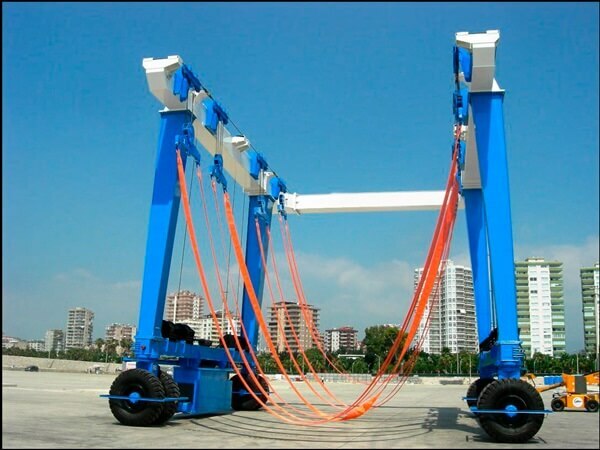 For the crane traveling, it can move in diagonal direction, it also can steer in 90 degree or do pivot steering,it also can put the boat in any designated position according to requirements. 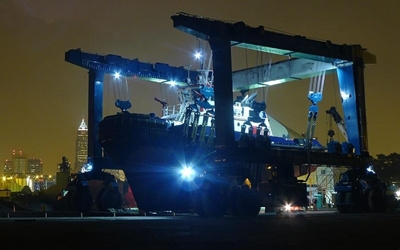 Main girder can adjust the span according to the boat width for handling different width boat. Low expenses, high performance, easy to operate and maintain etc. 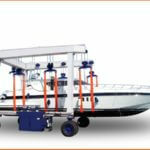 Low cost on the daily operation, it adopts the soft&firm belt to ensure no harm to the boat when hoisting. 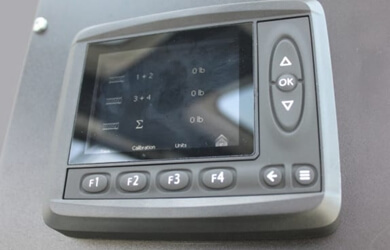 It can make the boat in order quickly, it also can adjust the gap between each boat according to different condition, reducing the wasted space. 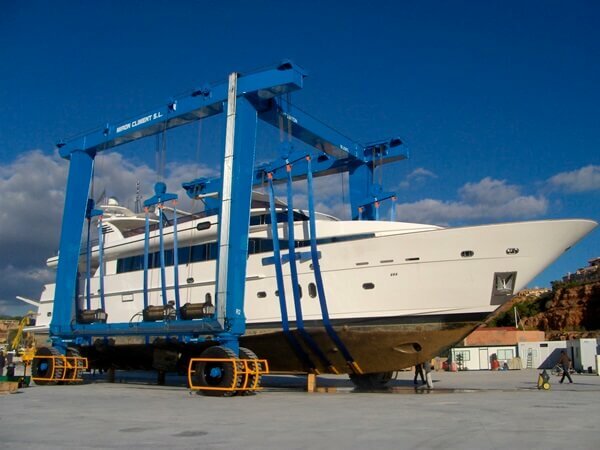 Our boat hoists are available in custom heights and widths to meet the specific requirements of your yard. Eliminate the need to raise your voice on the job. The level II sound suppression kit sets the industry standard in noise reduction-including foam lining, louvers and a hospital-grade muffler. It’s ideal for yards using additional equipment. It can meet the requirements of local noise restrictions. Maximize efficiency and yard space with additional drive motors that allow your boat hoist to travel over inclined, uneven or sloped surfaces. Increased grade-ability is recommended for yards with non-concrete or asphalt surfaces. 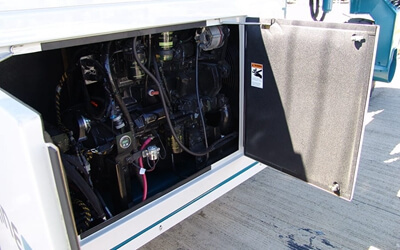 Our boat hoists’ lower side beam can be converted to accommodate more fuel capacity. This option is designed for yards that run long shifts, have limited fuel accessibility or operate in hurricane-prone regions. Ensure maximum operator comfort (particularly in colder climates) with a lockable door, sliding windows, windshield wiper, heater and window defrosting fan. 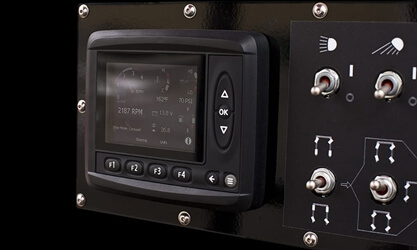 Optional air-conditioning is also available for the enclosed cab. Our travel lifts can be painted with a custom color. 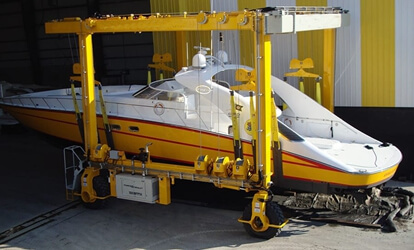 Our boat hoist crane offers a cold start kit for our mobile boat lifts to assist in the warm-up procedure in cold environments. An Arctic Operation Package (-25°C to -40°C) is available for extreme cold conditions.